Although three empty boat pits had been discovered, a fourth pit was found in 1954. 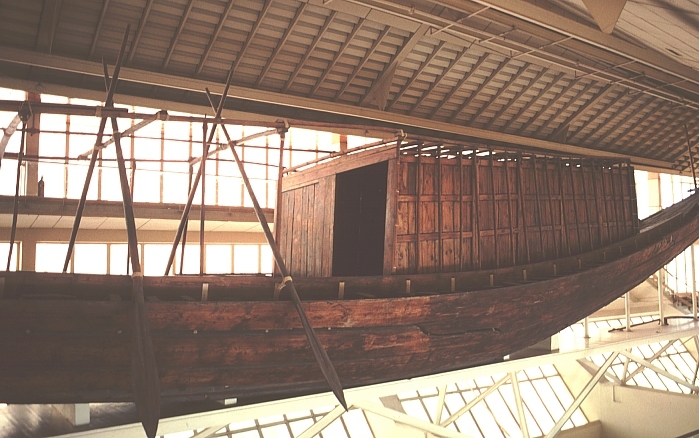 Under limestone blocks and plaster, a dismantled boat was located, with both the wood preserved and ropes for rigging and matting. 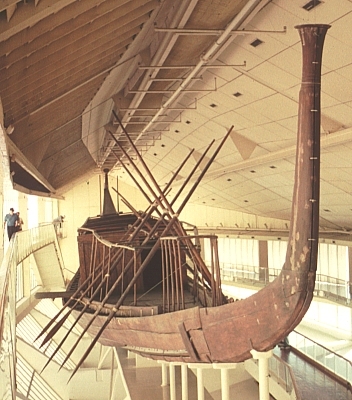 The reassembly took more than 10 years and the funerary boat is exhibited in its entirety near the pyramid of Cheops (Khufu). In 1987 drill holes in a fifth boat pit revealed, through a video camera lowered into the space, that another boat was preserved under thick limestone slabs. 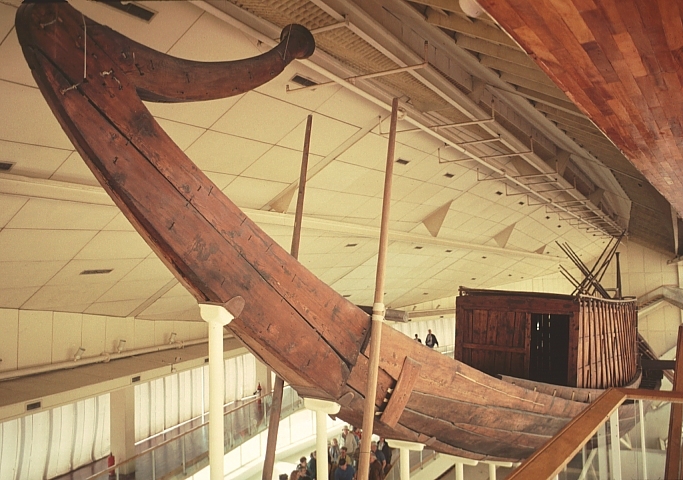 This boat resembles paintings and models of boats that have survived since the Fourth Dynasty. The papyriform boat shape is linked with the "wia" or the boat of the sun-god. The voyage of the sun-god through creation was usually portrayed as a boat journey--as if air were the Nile river. In the sunrise, ancient Egyptians saw their own resurrection after death. It is not certain, however, that this boat was actually used in funerary rites to convey the dead pharaoh through various rituals in the stages of embalment and purification-- or if it is thus accurate to refer to it as a "solar boat." 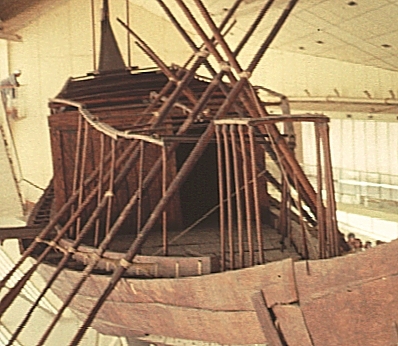 The evidence suggests that this boat was actually used in the water; and since the boat had to be dismantled to fit in the boat pit, one can assume the pit was not built for this specific boat. Christine Hobson says that "the boat had been functional, but its unwieldiness suggests it was not for travelling long distances. 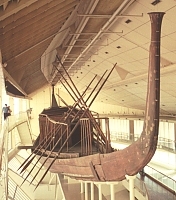 It may have been used as a state boat during the king's lifetime and perhaps it even carried Cheop's body to the plateau of Giza prior to its embalming and burial in the pyramid" (77). The boat is 143 feet long and 19 1/2 feet wide with an estimated displacement of more than 45 tons. 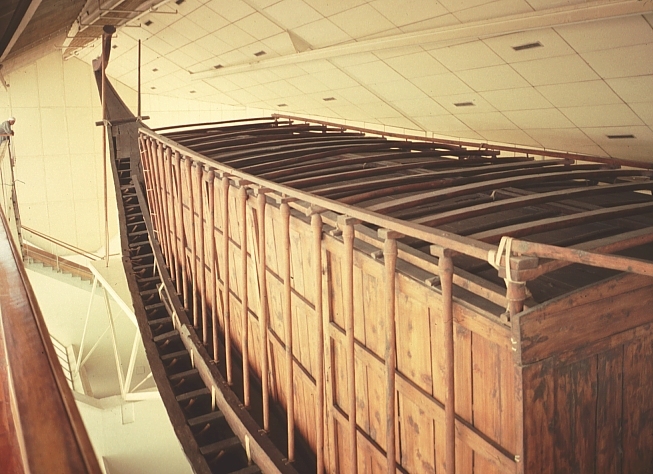 Hundreds of pieces of shaped wood comprise the hull which was held together with rope. Since wet wood swells and rope shrinks, the boat would become water tight in water, making caulking unnecessary. The boat had six pairs of long oars, one pair by the stern post serving as rudder oars. The closed cabin is paneled and has palm-form capitals. The open canopy (supported by 12 poles) in front of the cabin might have been hung with cloth or mats. The small cabin at the front was probably for the captain and/or pilot's use. 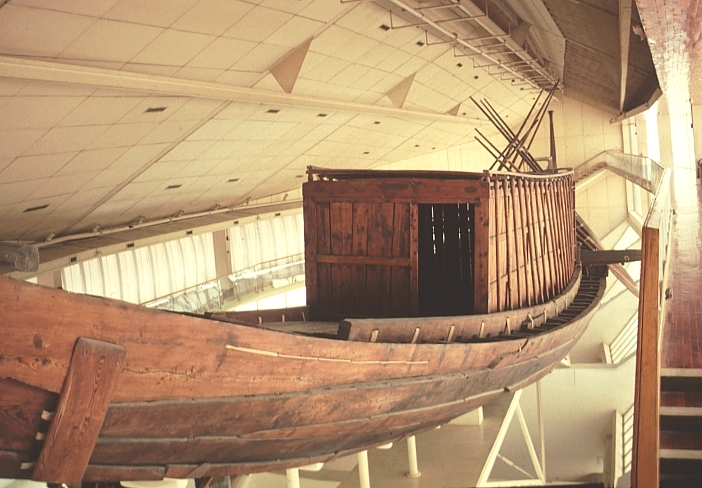 The boat is sometimes said to be constructed of imported cedar from Lebanon; other scholars say it was made of a wood, maybe pine, native to Egypt. Click here to go to the Egypt Index.